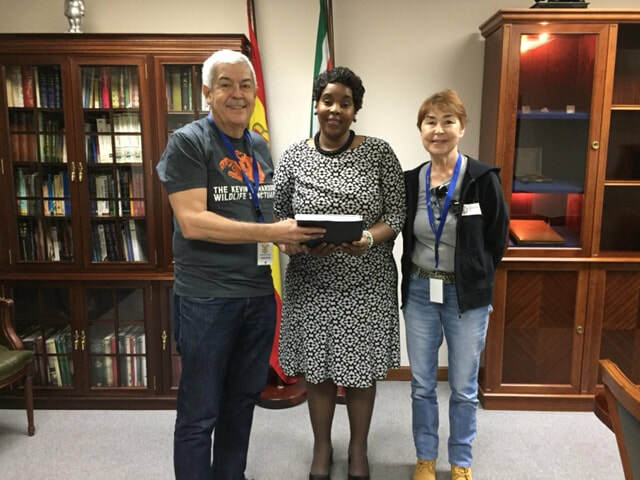 ​Here is a brief report of the handover yesterday Oct 4th at the South African Embassy in Madrid of the petition to the South African Government to stop the exploitation of captive bred lions and the export of lion bones. A representation of Chelui4lions and Lion-s Roar-Stop Canned Hunting met with the Embassy Counsellor, Mrs GSM Motlhamme, since the Ambassador was away from Madrid on a business trip. The Counsellor showed great interest in what the petition was all about and expressed her concern with the cruelty surrounding the whole process of breeding lions, canned hunting and export of lion bones. She clearly understood that we were requesting - a zero quota for the export of lion bones. She was very much interested on where, in other capitals the handover of the petition was taking place, indicating that as member of the Department of International Relations and Cooperation, the international opinion was very important. ​She indicated that the Embassy will inform the Department in South Africa about the meeting and the request to pass the petition to Mrs Edna Molewa, Head of the Department of Environmental Affairs. She will inform us when a response from South Africa is received. Included here you will see a picture of our group members and of the actual handover ceremony to Mrs Molthamme. ​Just expose their complicity in canned lion hunting. 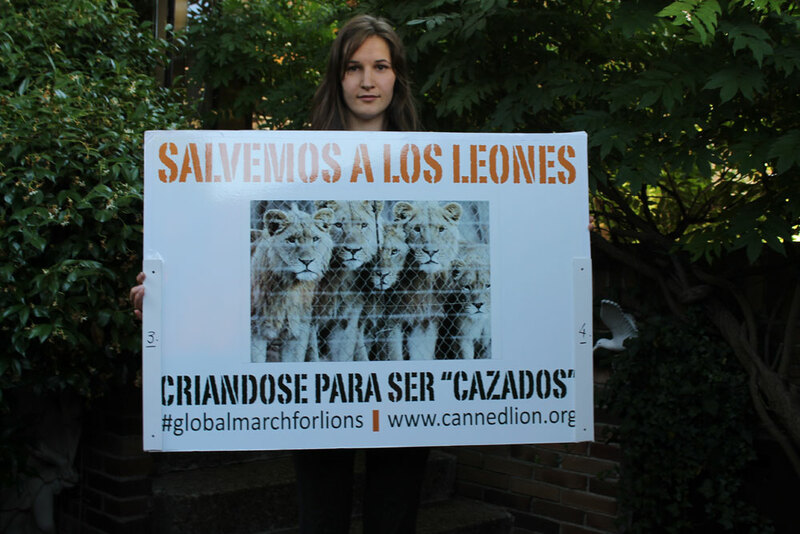 Yesterday, a representation of CACH SPAIN celebrated a symbolic act in front of the South African Embassy to protest for canned hunting not being yet illegal in South Africa. A protest letter was delivered to the Embassy. We sincerely give our thanks to the Ambassador and the first Counsellor for their kind reception, their understanding of our protest and their attention to our explanations. We would like to thank some of our CACH SPAIN members who were able to take time away from work to attend this act. The ambassador greeted us in front of the embassy and was especially kind and attentive. We took videos inside the embassy of our personal delivery of the protest letter to the First Counsellor. Video to come. We attended the open house of GREFA, (Rehabilitation Group for Spanish Wildlife and It´s Habitat), www.grefa.org. It was a complete success. A lot of people, (children as well), attended and learned a lot. We had an amazing day. It was great to be back with old colleagues and to remember years of wonderful adventures together. We had an opportunity to talk with many people about CACH and our mission. We will be giving presentations of our new video at GREFA to the public beginning sometime in September. Grefa is supporting Cach in our endeavor. Thanks GREFA for the many important differences you are making in helping save our wildlife. I was thrilled once again to be a part of the release of three Kestrels back into to their natural habitat. Exhilarating! Why GREFA? For those of you who did not know I worked at GREFA for ten years. We attended a fund raising event hosted by FAPAM. FAPAM, www.fapam.org is a federation of the following animal protection associations: ALBA, ANDA, APAP Alcalá de Henares, EVOLUCIÓN, JUSTICIA ANIMAL, La Voz Animal, PERRIGATOS EN APUROS, SPAP de Madrid, with the support of of Fundación de Ayuda a los Animales. We had a great time. The food was delicious, (buffet), with more than enough to eat. There was a good sized crowd in attendance, and although the evening was about FAPAM and the work they have been doing during this year, we were able to talk to several people about our lions. The situation was the same; no one knew ANYTHING about canned hunting or about breeding farms or about Spain being at the top of list in Europe for trophy hunting – on and on. As always, we had no trouble getting their attention. People are always shocked and seem to soak up the information we share with them; eager to learn more by going to our website and Facebook. In that sense, it was a successful evening for CACH as well. Anoche, asistimos a la cena benéfica anual que organiza FAPAM para recaudar fondos. FAPAM, www.fapam.org está constituida por las siguientes asociaciones: ALBA, ANDA, APAP Alcalá de Henares, EVOLUCIÓN, JUSTICIA ANIMAL, La Voz Animal, PERRIGATOS EN APUROS, SPAP de Madrid, y, con el apoyo de la Fundación de Ayuda a los Animales. Nos lo pasamos muy bien. El bufet estaba bien surtido y la comida estaba deliciosa y más que suficiente. Había bastante gente. Además de conocer a voluntarios y socios, tuvimos ocasión de hablar con varias personas sobre nuestros leones. Como ocurre muy frecuentemente, no se conoce nada de la caza “enlatada”, ni de las granjas de leones que la apoyan. Se quedan todos estupefactos al saber que España está a la cabeza de Europa en la importación de trofeos de caza de leones. Todos con los que hablamos mostraron mucho interés en apoyar y seguir informados a través de nuestra página en Facebook. Las personas que están detrás de estas asociaciones son realmente fantásticas dedicando gran parte de sus vidas a defender los derechos de los animales, a rescatarlos de tratos crueles, a protegerlos de abusos, a darles un cobijo y gestionar su adopción si es posible, y a educar sobre todo a las nuevas generaciones en el cuidado y en el amor a los animales. Nosotros les apoyamos totalmente y hablamos también de seguir colaborando en la defensa de los leones. Hemos incluido fotos del evento y en una de ellas nos podéis ver junto a dos personas de las más comprometidas con la defensa de los animales, Carolina, de Alba (a la dcha) y Arancha, de SPAP(a la izq). First lesson when protesting at a Zoo, get there before the visitors do. If you consider doing something at the zoo, the very first lesson we learned is get your act together and be set up and ready just as the zoo opens. Unfortunately, we had arranged for our core group members, (half of which we not able to attend - just the same we were an "eager beavers" seven), to arrive at the requested time of 11:30 - one hour after the zoo opened. Anyway, Luis and I were there before 11:00 getting things set up and organized but should have had this done by 10:30. The parking lot was already nearly full and the crowds that descended from the parking lot towards the entry/ticket gates reminded me of swarms of bees attacking nest invaders. We were pretty much ready to go by 11:30 - our crew was on hand and ready to work. The day was gorgeous, sun high in the sky, a slight pleasant breeze, birds singing and storks circling above, excited voices of children desperate to be the next ones through the gates, etc., etc. These were the bests moments for us. People had to wait in line and were more inclined to listen to what we had to say about our lions. After all, where else could they go and what did they have to lose? I think at first they thought we were there in protest. Everyone looked at our posters and placards and seemed a bit confused as to whether we were good guys or bad guys - were we for or against zoos having lions and so forth. In so much as they couldn't go anywhere, they listened very well and asked a lot of questions. They were surprised by what we had to tell them and just what it was we were trying to achieve. The children were especially great. As soon as they saw the face of Sheila´s lion, they said things like, "Oh look. Lions. They are my favorites. I want to go see them!" AND "Do you take care of the lions here?" Statements like that gave us openings to do our thing and the children seemed to respond with concern about the lions being in trouble. As I mentioned before, it was a beautiful day but every once in a while that lovely little breeze would act up and turn into a rather powerful annoyance. Our visual aides would take off rolling down the hills or into the visitors waiting to purchase their tickets. Obviously we had to chase these materials down but it was really something special to see people step out of the line, lose their place and help us with the chase. Another good opportunity to talk about why we were there. Here´s a funny little story. Right in front of the entry gates there was a cranky, weird little lady who had her own concessions stand. She was adamant about us encroaching on what she considered to be her territory. She kept insisting that we remove ourselves from her space - that she was paying rental fees for her spot. It was like she had an invisible line drawn around her space. We didn´t at any time cross that line really. She just didn't´t want us to take away attention from her business. I could understand that and we tried to speak respectfully to her. I asked her if she wanted to know the reason why we were there and if she was interested in lions and their future. She said, "No. 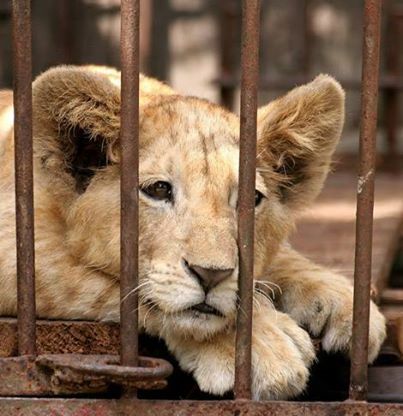 I don´t care about lions and I don´t care about what is happening to them!" I thought how strange to have a business then at the zoo but kept from getting into an argument with her. She had a number of items to sell but spent her entire time trying to sell peanuts. "Peanuts. Peanuts. Peanuts!!!!" Over and over again. After a while we got rather annoyed by this and every time she said "Peanuts" we responded immediately with "lions"!!! We could hear a speaker inside the zoo announcing, "Please do not feed the animals peanuts. They can be harmful to some." Are people floating in space most of the time? We had so much fun getting the best of her. We met so many people from so many different places in the world. For example, we met a young family of five; Husband, wife, and three small children. They were in the line so we approached them and asked if they were interested in listening to the story of our lions. The man was very kind and he listened for a while but then he stopped us and said, "I feel very deeply for your cause and I wish you well. However, I have come to Spain with my family from Iraq for one month. I want my daughters to know that life is not always about killing people and death. That life is about living!" We told him to have a wonderful time with his family in Spain and be sure to go see the lions inside the zoo - that we would be thinking about him and praying for his country and hopefully that he would be thinking about us. I didn´t want to tell him that the lions in the zoo probably came from SA breeding farms. We agreed to think about each other. We learned something yesterday. You don´t need a reason to take your visual aides to the zoo. You can go anytime, walk around, talk to the people. Go by yourself or with a friend. Luis and I are planning to do that off and on during the summer. We also thought what a great place to have WAD at the zoo as well. At least for those of us who have zoos around us. Something to think about. All in all, we were on our feet for seven hours. A few members of our group members sat down once in a while for a wee rest and a drink of water. I´m so proud of them. They worked so hard and made contact with so many people. We handed out lots of brochures with all of our information. A lot of people asked what they can do to help. So. Our next plans for the end of July/early August are either "Parque Atraciones" (Madrid Amusement Park), or Rosales, (another beautiful park close to the Royal Palace. (Rumor has it that our new king is keen on the environment.) Maybe something else will come into mind. I cried off and on throughout the day just thinking about our lions and all of our beloved animals in danger of extinction. It was a great day however, and the group had a very good time helping get the word "out there". Something new happened for the first time for us. Families refused to let us take pictures of themselves with their children. They are very afraid of exposing their children to any kind of harm through Facebook, etc. If we got too close they got very nervous. So, we didn't want to cause any problems and just kept things low keyed. So, watch for this in the future.